Spain has always had a reputation of good quality cinema. During its long story, it was the great filmmaker Luis Buñuel who first achieved universal recognition, when together with Salvador Dalí made the surrealistic Un Chien Andalou in 1928. However, due to the nation’s political isolation, Spain did not participate in the European cinema new waves, and remained mostly inconspicuous. The “new cinema” of the ‘60s produced some great films, but only after Franco’s death in 1975, Spanish cinema gained renewed international recognition, led particularly by its “terrible child” Pedro Almodóvar. Since then, a whole generation of filmmakers has grown-up and kept producing interesting work, and many other talented, cine-literate artists have emerged. 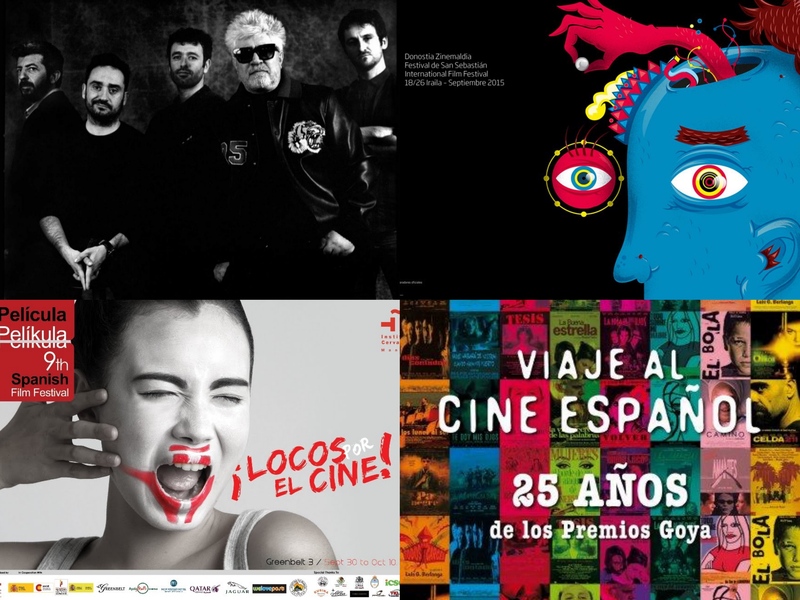 For this list I picked 15 great Spanish films of the 21st century, which put in evidence the talent of Spain’s contemporary filmmakers; for the sake of variety I chose only one film per director. Enjoy them, and let me know which one is your favourite! The plot: A Spanish woman living in Buenos Aires returns to her hometown to assist to her sister’s wedding. Unexpected events, though, will upset the wedding and bring deeply buried family secrets to the surface. Go see it, because… This is another great film by the Iranian director Asghar Farhadi, who reunites this time an outstanding cast: Penélope Cruz, Javier Bardem and Ricardo Darín, among others. 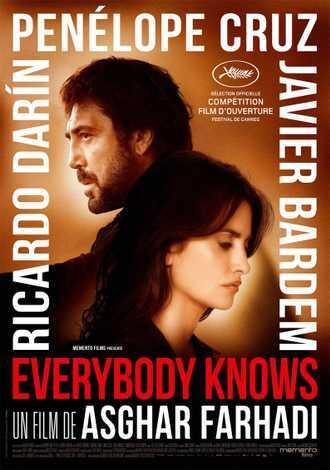 Everybody Knows provides an emotional and thought-provoking journey into a small Spanish community, evokes several contemporary dilemmas, and leaves the morality of the story open to the viewer’s judgement. The plot: A young businessman wakes up in a hotel room next to the body of his dead lover. He hires a prestigious lawyer to defend him, and over the course of one night, they work together to find out what happened. 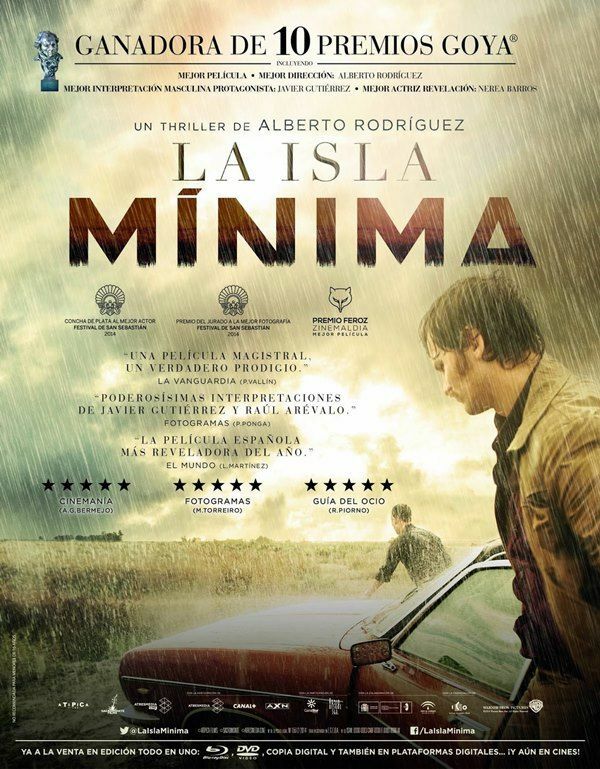 Go see it, because… It is an awesome thriller with great acting and pacing, masterfully directed and exquisitely written by Catalán Oriol Paulo. Tense and suspenseful, it is certain the plot twist at the end will leave completely shocked! The plot: Julián, a theater actor, has had cancer for a year, and his only companion is his dog Truman. When he receives an unexpected visit from his friend Tomás who lives in Canada, the two men, together with Truman, will share emotional and surprising moments trying to cope with Julián’s complicated situation. 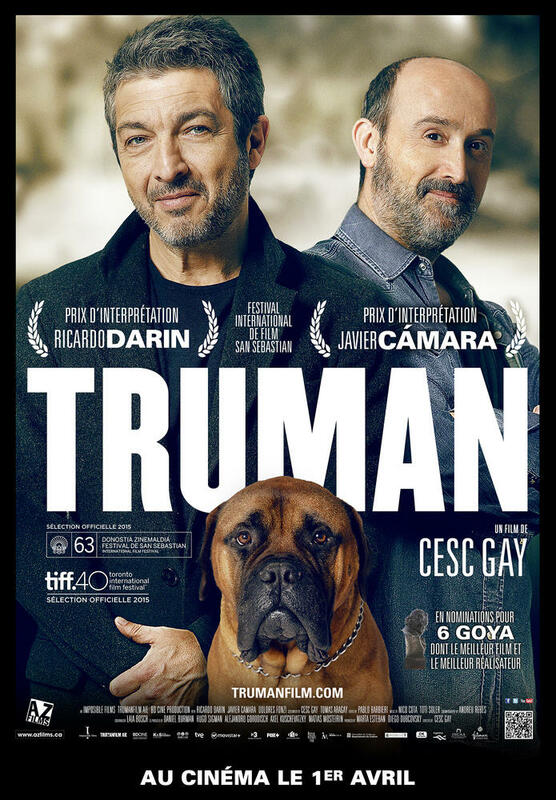 Go see it, because… Directed and written by Cesc Gay, with the adequate dose of honesty and realism, Truman is a moving, sweet and sour, well-acted comedy/drama about grief, friendship, love and family. 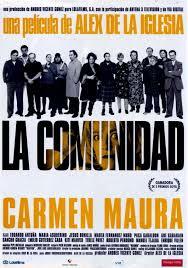 Cámara and Darín are superb in their roles, providing effortless, emotional depth to their characters. The plot: Rafa is a Sevilian who has never left his native Andalucía, until he meets a Basque girl named Amaia and decides to follow her to the Basque Country. A series of misunderstandings forces Rafa to impersonate a full-blooded Basque with eight Basque surnames, getting more and more entangled in that character in order to please Amaia. Go see it, because… Emilio Martínez Lázaro’s romantic comedy was a box-office phenomenon in Spain, becoming the highest-grossing Spanish film of all time! Besides its solid script and amusing characters, the film’s huge success is arguably due to the way it deals with the different stereotypes and preconceptions among the different Spanish regions, a subject always relevant to the country. People who are not familiar with Spanish local traditions, accent and politics may miss some of the gags, but everybody will enjoy most of the hilarious situations, and the beautiful scenery of País Vasco (Basque Country) and Andalucía (Andalusia). The plot: In 1980, two Madrid homicide detectives are sent to the Guadalquivir Marshes in Spain’s ‘Deep South’ to investigate the disappearance of two teenage sisters during the town’s festivities. Both detectives must settle their ideological differences and bring the murderer to justice before more young women lose their lives. Go see it, because… It is a hypnotic, multi-layered thriller, masterfully directed by the talented Alberto Rodríguez, with breathtaking photography and superb acting. A careful character-study, which also introduces some political undertones during a turbulent period of the Spanish history. 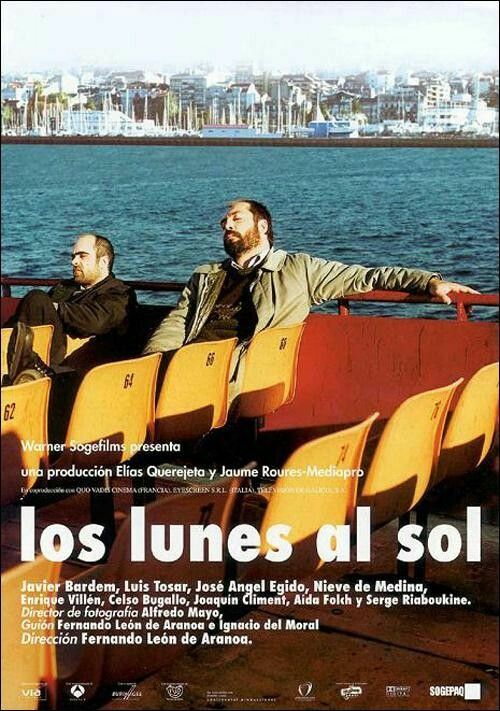 The film received 10 Goya awards (Spain’s main national annual film awards), among many other prizes and nominations. The plot: As a director and his crew shoot a controversial film about Christopher Columbus in Bolivia, local natives rise up against the privatisation of their water supply. The production is beset by more and more problems and the riots escalate, raising the tension between the crew members and leading them to a moral crisis. Go see it, because… Written by Paul Laverty (Ken Loach’s regular collaborator) and skilfully directed by Icíar Bollaín (who is also a well-known Spanish actress), the film examines a social and political event that took place in Cochabamba, Bolivia in the year 2000, known as the Water War. Featuring an excellent cast, which includes the Mexican actor Gabriel García Bernal, the film parallels indigenous resistance 500 years ago and nowadays, managing not only to teach us without dogmatism and bias, but also to be moving and entertaining. The plot: Juan Oliver reports to his new work as a prison officer one day earlier to make a good impression, leaving at home his pregnant wife Elena. During his tour of the prison though, a riot in the High Security zone begins, leaving him trapped inside Cell 211. Juan must then pretend to be another inmate in order to guarantee his own safety, while trying to draw a plan to get him out of the prison. The situation escalates though, and unexpected shifts occur, both within and outside the prison. Go see it, because… It is a raw, enthralling thriller, with great plot and character development, and edge-of-the-seat suspense. Excellent direction by Daniel Monzón and top-notch acting add up to make Celda 211 a memorable film. It was an artistic and commercial success; it received 43 awards (including 8 Goya Awards) and 24 other nominations. The plot: Late-night TV reporter Angela and her cameraman are following the night shift of Barcelona’s fire station. When they receive a call from an old lady trapped in her apartment, journalists and firemen remain confined inside the perilous building. A terrible nightmare ensues, which is thoroughly recorded by the TV crew. Go see it because… It is a superb horror film, among the scariest I have seen lately, but also a dark satire of the mass media. It may remind us The Blair Witch project; nevertheless, it is quite fresh and original in its plot development and ending. 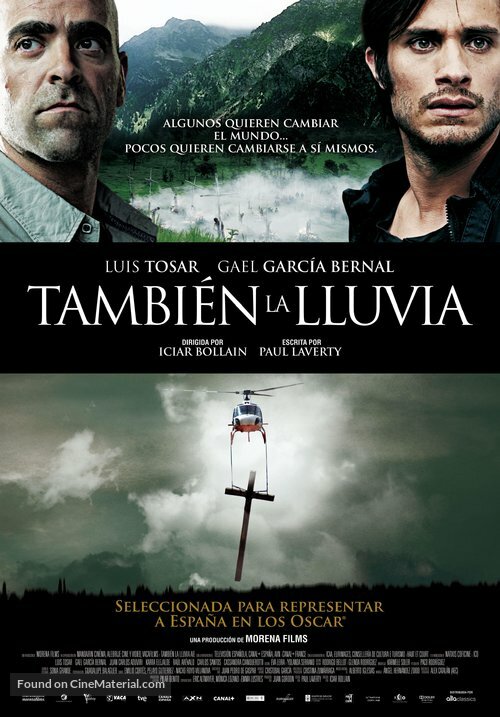 Co-directed by Jaume Balagueró and Paco Plaza, the film was so successful that inspired an American remake, Quarantine and three sequels, [REC]2, [REC]3 and [REC]4. The plot: A woman brings her family back to her childhood home, which used to be an orphanage. Before long, her son disappears, and is later presumed dead. Grief-stricken Laura believes she hears spirits, who may be trying to help her find the boy. 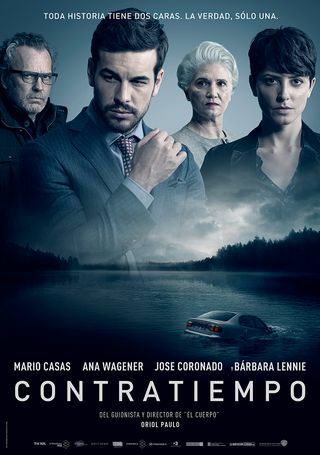 Go see it, because… It is a scary, creepy, thrilling and suspenseful film, but also a moving and intelligent one, wonderfully acted by Belén Rueda and carefully directed by Juan Antonio Bayona. 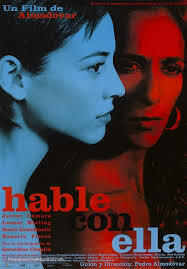 It was critically acclaimed and received multiple national and international awards, including 7 Premios Goya. The plot: In the falangist Spain of 1944, a young girl fascinated by fairy-tales is sent to live with her stepfather, a captain of the Spanish army. As the girl witnesses her stepfather’s sadistic brutality, she is drawn into Pan’s Labyrinth, a magical world of mythical beings. Go see it, because… This is one of the most critically acclaimed films of Spain’s contemporary cinema, directed by Mexican-born Guillermo del Toro. It won 99 awards, including 3 Oscars; it is on IMDB’s best films of all time list (#129), with a Metascore of 98! 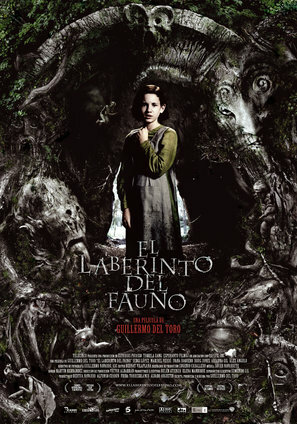 Of course, all of them deserved: El laberinto del fauno is indeed a beautiful, magical, dark fairy tale, a brilliant and timeless masterpiece. The plot: The true story of former sailor and writer Ramón Sampedro, who was quadriplegic for almost thirty years and fought in court in favor of euthanasia and his own right to die. Despite his wish to die, he taught everyone he encountered the meaning, value and preciousness of life. Go see it, because…Young director Alejandro Amenábar had already displayed his talent before in the films Tesis, Abre los ojos (Open your eyes) and The Others. With this movie, though, not only he established himself as one of the best Spanish directors of his generation – he also wrote, edited and scored the film – but also managed to tackle an extremely delicate subject with utmost dexterity and sensibility. Not to mention the exceptional cast –Javier Bardem, Belén Rueda, Lola Dueñas- which adds up to make this film a beautiful and unforgettable piece of art. 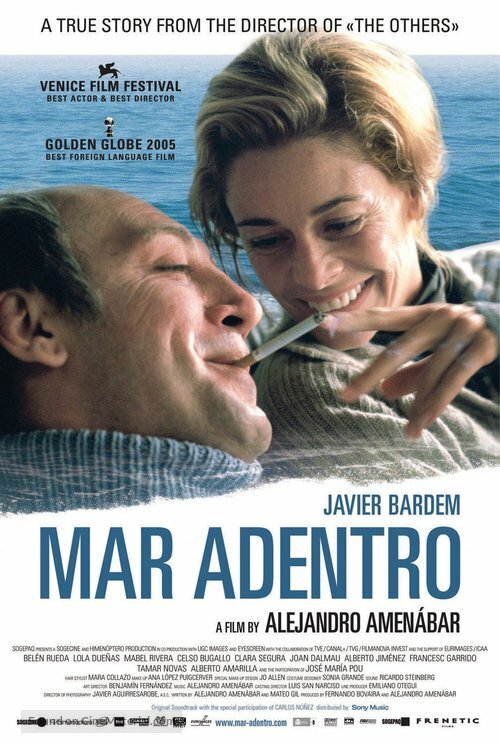 Mar adentro won the Oscar for Best Foreign Language film, as well as many other national and international awards. The plot: After a chance encounter at a theater, Benigno and Marco meet at the private clinic where Benigno works. Marco’s girlfriend is a bullfighter who has been gored and is in a coma. Benigno is looking after Alicia, a young ballet student who is also in a coma. The lives of the four characters will intertwine, dragging them towards an unsuspected destiny. Go see, it because… Pedro Almodóvar is arguably Spain’s most iconic filmmaker; his particular style, although irreverent, sarcastic and witty, always manages to dig deeply into the human soul. Hable con Ella is regarded as Almodovar’s greatest film: it is a very profound and multi-layered film about love, friendship and existence. Brilliant, disturbing and thought-provoking… Hable con ella was internationally acclaimed, obtaining many international awards such as Oscar, Golden Globe, BAFTA, Cesar, among others. The plot: A group of men left jobless by the closure of the shipyards in Vigo, Galicia bide their time together in the local pub, opened and run by one of their former coworkers. The group is held together by the affable Santa, who is the de facto leader and sometimes father-confessor. Go see, it because… Director Fernando León de Aranoa deserves credits for capturing the feeling of the unemployed with no family, possession or future in such a poignant and realistic manner, without becoming dull or boring. Besides its impeccable direction, the film delivers a really intelligent – and relevant – script, and outstanding acting by two among Spain’s best: Javier Bardem and Luis Tosar. Go see, it because… Alex De La Iglesia is well known for his dark comedies – his 1995 El día de la Bestia (The day of the Beast) catapulted him into fame – and this film is no exception: it is a terrific dark tale that brings out the darkest side of human nature. No need to show devils, zombies, or evil spirits: nothing is scariest than the guy next door! The film is creepy, suspenseful and crazily funny; the characters – led by the great Carmen Maura- are all memorable. 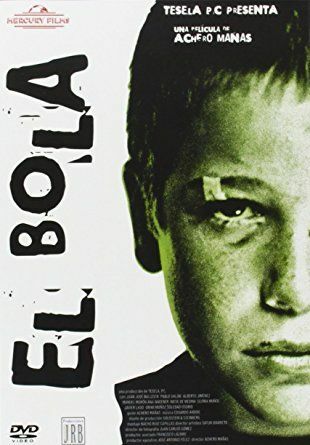 The plot: El Bola (“the Pellet”) is a 12-year-old boy emotionally and physically damaged by the constant abuse of his father. The arrival of a new boy at school exposes him to the true meaning of friendship and family. Go see, it because… The film deals with a very relevant issue, that of child beating, which is displayed with great realism – although keeping violence to a strict minimum, pertinent to the story-telling – and deep characters, who avoid exaggerating the crude and difficult situations enacted. Remarkable cast, excellent direction by Achero Mañas, who won 4 Goya awards with this film, including best film and best new director. Do you agree with this list? 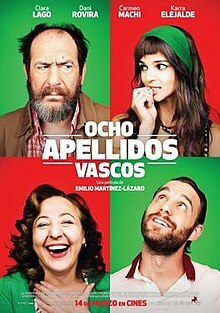 Let me know of other, great Spanish Films! With the end of Brazil’s dictatorship, a renewed feeling of freedom invaded the youth of the 80s. This generation of artists, free to openly portray their feelings and desires, gives rise to what would be called BRock, or Brazilian rock. Emblematic bands of this decade are Blitz, Paralamas do Sucesso, Titãs, Ultraje a Rigor and Legião Urbana. Irreverent and uncompromised, they would be frequently accused of being superficial, banal and alienated; their songs though demonstrated they were nothing like that: they would often criticize the 80s social reality, particularly consumerism and the influence of television. The year 1985 is certainly engraved in the memory of rock lovers: the colossal festival Rock in Rio takes place. Rock in Rio counted with the presence of the world’s greatest rock artists such as Queen, Rod Stewart, AC/DC and Yes; it remains in history as the largest Rock Festival of all time, with an audience of nearly 1.5 million people. Although rock and pop were the predominant genres in Brazil during the 80s, other musical styles would gain increasing popularity by the end of the decade, such as sertanejo, pagode, afro and axé music. For the Brazilians, Rita Lee is one of their dearest artists. With an impressive record of 55 million albums sold –Brazil’s highest grossing female artist of all time- the “Queen of Brazilian Rock” is a not only a singer, but also a talented songwriter, multi-instrumentalist, actress, writer and activist. 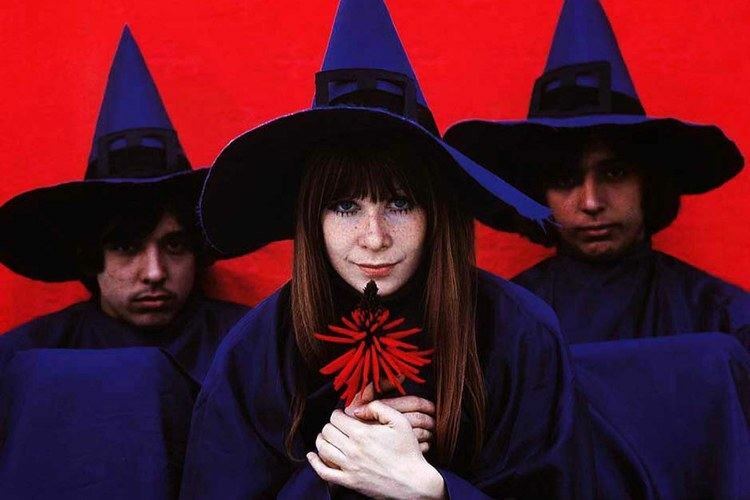 Former member of the influential group Os Mutantes, Lee has participated in major revolutions in the world of music and society. Her songs, often with an acid or feminist tone, have become ubiquitous in the charts throughout the latest 50 years. Lança perfume is one of her most popular songs; it makes reference to an aromatic spray often used as a recreational drug, very popular in Brazil. Essential Brazilian artist, one of the most amazing voices, Gal Costa is known for her perfect pitch and incredibly high notes. Timeless and always relevant, Gal is constantly reinventing herself: she went from a Tropicalia icon in the 60s, a hippie muse in the 70s to a more pop repertoire in the 80s and nowadays, in her latest albums, she has been even exploring electronic music. This song (English “Countryside Party”) from her 1981 double album Fantasia became her biggest ever hit, going multi-platinum by the end of the year. Djavan is a singer, songwriter, producer and guitarist, highly praised not only in Brazil, but internationally: his songs have been recorded by Al Jarreau, Carmen McRae, the Manhattan Transfer, and many other fundamental Brazilian artists. Djavan combines traditional Brazilian rhythms with popular music drawn from the Americas, Europe and Africa; his songs are known for their “colors”: refined and poetic, but utterly simple at the same time. In 1982, he recorded the universally acclaimed album Luz, which has been described as a “pop explosion (…) a succession of hits with exquisite use of the technological resources of the time”. From this album comes the song Samurai, in which Stevie Wonder is a guest star. A major pop star in Brazil in the ‘70s and ‘80s, Gonzaguinha was the son of the famous baião artist Luiz Gonzaga. Although he decided to follow his father’s footsteps, he was a great singer in his own right, adopting a completely different style. Being born and raised in a poor Rio de Janeiro favela (shanty town) made him quite adept at writing about the social and political conditions of Brazil’s poor; his aggressive and unappealing lyrics in the eyes of the media earned him the nickname “Cantor rancor” (Grudge singer). With the beginning of the political opening in the second half of the 1970s, he began to modify the discourse and composed songs of more pleasant tone; his fame skyrocketed. He was at the peak of this popularity when, in 1991 he died in a car crash. This is one of his most recognizable songs, it was released in the album Caminhos do Coração. Brazilian superstar with high-selling discography, Lulu Santos is one of the most emblematic figures of the 80s, a synonym with Brazilian pop music. This song (English “Like a wave”) was created by Lulu himself together with journalist and writer Nelson Motta, especially for the soundtrack of the movie Garota Dourada. Its lyrics describe the pleasures of an idealized beach culture, ultimately becoming a reflection on the contradictions of a youth oscillating between grandiose delusions and bohemian escapism. It was a smash hit. According to Rolling Stone Brazil, this song is the proof … “of Lulu’s indisputable dominance in the art of creating the Perfect pop”. Multi-talented Lobão (“Big Wolf“, in reference to the Disney’s Big Bad Wolf character), is a singer-songwriter, composer, multi-instrumentalist, writer, publisher, television host and media personality. Aside from his talent as musician, he has a reputation for having little inhibition in expressing his opinions and for publicly criticising fellow musicians, which led to a notable number of controversies and enmities. With the album Ronaldo Foi pra Guerra, the only album he released accompanied by the band Os Ronaldos, Lobão had the biggest success of his career, the super hit “Me Chama” (“Call Me”). Ultraje a Rigor is one of the most important Brazilian rock bands. With their simple and danceable melodies, and the irreverent tone Roger Moreira’s voice gave to the ironic lyrics, the band had all the ingredients to reach the Brazilian youth of the 80s. 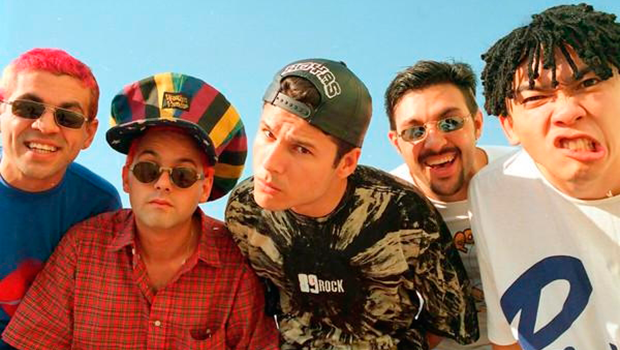 Their first LP, Nós Vamos Invadir sua Praia (We’re going to invade his beach) was a massive success: it was the first Brazilian rock LP to receive gold and platinum status. From this album comes Inútil (“Useless”), one of the most important protest songs of Brazilian rock, a compendium of the frustrations common to all Brazilian at the time. Paralamas do Sucesso is the most successful Brazilian rock band, with a long-lasting career since 1977, always with the same line-up: Herbert Vianna, Bi Ribeiro and João Barone. Their success has surpassed the Brazilian borders, making then a recognizable band in Latin America and Europe; furthermore, they have been many times awarded at the Latin Grammy, MTV Brasil and Multishow awards. Another emblematic Brazilian rock band that blossomed in the ’80s, Titãs (“The Titans”) became known for their intelligent lyrics, with poetic references and social criticism. The group eventually became mainstream, adopting a more pop approach and enjoying massive recognition. Jesus não Tem Dentes no País dos Banguelas (“Jesus has no teeth in the land of the toothless”) is Titãs’ most important album; it was a huge commercial success (double platinum certified), but also highly acclaimed by the critics. One of the best tracks of this album is Comida (“Food”). Its lyrics affirm that people’s needs go beyond their own material existence -represented by food- requiring cultural and existential necessities, such as fun and art. Comida frequently served as the motto for student protests, which increased even more the band’s reputation. Legião Urbana was formed during Brazil’s economic crisis of the ’80s, when corruption became deeply rooted in the country’s politics. This was Renato Russo’s motivation to create his band “Urban Legion”. Russo’s incandescent lyrics, portraying the frustrations of an entire generation, gave voice to a multitude of desperate people and became a phenomenon of popularity throughout Brazil. The band’s success was cemented in 1987, with Que País É Este (“What Country Is This”). They developed a devoted following, and the band came to carry the nickname “Religião Urbana” (meaning “Urban Religion”). While they disbanded officially in 1996 after Russo’s death due to AIDS complications, Legião Urbana is still one of Brazil’s most famous rock bands. 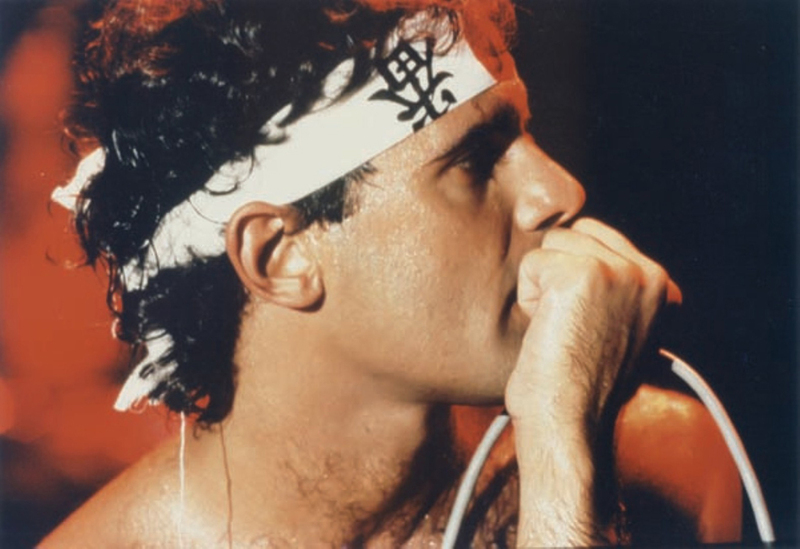 Vocalist of the first Brazilian rock band Barão Vermelho and highly popular as a solo artist, Cazuza left his personal mark on Brazilian music through his songs, which continue to be constantly recorded by other artists, in spite of his early death in 1992 due to AIDS complications, at 32 years old. Brazil’s music transition into the 70s was marked by the consolidation of MPB (Música Popular Brasileira, Brazilian Popular Music) which now incorporates into its repertoire different rhythms, not only from Brazil’s different regions (such as the northeastern baião), but also from foreign countries (like Jamaican reggae). Standout artists of the 70s MPB are, among others, Caetano Veloso, Gilberto Gil, Chico Buarque, Gal Costa, Simone, Elis Regina, Rita Lee and Maria Bethânia. The Jovem Guarda had already made its appearance in the 60s and was still very popular in the beginning of the 70s. Nevertheless, Brazil was under military dictatorship at that time, and the cultural elites accused these artists of being “alienated” from the country’s social and political problems; as a result, the movement soon lost its strength. Without the presence of the nonchalant Jovem Guarda, a different genre of popular romantic music emerged, which would gain the pejorative epithet “cafona“, then replaced by “brega” (both words meaning “tacky”). Once the name got accepted by its fans, brega music became a trend and won a wide audience. Many artists belong to this genre, although its fame was consolidated by Waldick Soriano. Since the end of the Jovem Guarda, Roberto Carlos also approached a more romantic, brega style; nevertheless, he managed to establish his position as the country’s most popular singer. This incredibly beautiful song (English: “I know I will love you“) was composed by Antônio Carlos Jobim and Vinícius de Moraes. Although initially recorded by Maysa, it would become a classic when performed live in Buenos Aires by Vinícius de Moraes, together with two iconic artists of Brazil’s music stage of the 70s: Vinicius’s favourite vocalist Maria Creuza and his long-time partner, singer and guitarist Toquinho. He would later include it on his 1970 album En ‘la Fusa’ con Maria Creuza y Toquinho (also known as “Grabado en Buenos Aires con Maria Creuza y Toquinho”). The amazing melody by Tom Jobim, and Vinicius’ impassioned lyrics on the immortality of love would establish “Eu sei que vou te amar” as one of Brazil’s quintessential songs. Indeed, it was voted the best Brazilian song of all times in a survey organized by Revista Bula. “Tropical Country” was composed by Jorge Ben Jor, but it became a hit when singer Wilson Simonal released it on his 1970 Album, Simonal. Over the years, the song would be increasingly credited to its author, overshadowing the success of the first version by Simonal. It has also been adapted by many composers and singers like Sergio Mendes, Ivete Sangalo, or even Shakira, but also by Jorge Ben Jor himelf, on his album Tropical in 1976. “It was a river that passed in my life” is the song that gives the name to the second album of carioca sambista (samba composer) Paulinho da Viola. The song was a huge success, being sung by the masses during Rio’s carnival, and became Brazil’s biggest hit of the 1970, projecting Paulinho nationally. This is another fruit of Toquinho’s long partnership with Vinicius de Moraes, which would last until Vinicius death in 1980. Composer and performer with 50 years of sucessful career, Toquinho has to date 84 records released, over 450 compositions and about 8,500 shows in Brazil and abroad. This song (“Afternoon in Itapoã”) immortalizes Itapuã as a serene, romantic and exuberant place, located 20 km from the center of Salvador de Bahia. Unfortunately, spending an afternoon in Itapuã is no longer the quiet program Vinícius and Toquinho described: the neighborhood became Salvador’s noisiest and one of the most polluted. Brazil in the early 1970s was a land of paradoxes: under military government, the so-called “Brazilian Miracle” promised record economic growth; as a result, construction was booming. Workers though, would spend endless hours at the constructions and earned very little. This was also a period when censorship hampered artistic freedom of expression. Fearing persecution, Chico Buarque spent a brief period of exile in Italy; but longing his beloved Brazil, he returned determined to show his disagreement with the situation. And he managed to create a masterpiece. “Construction” is the chronicle of the life and death of a construction worker. 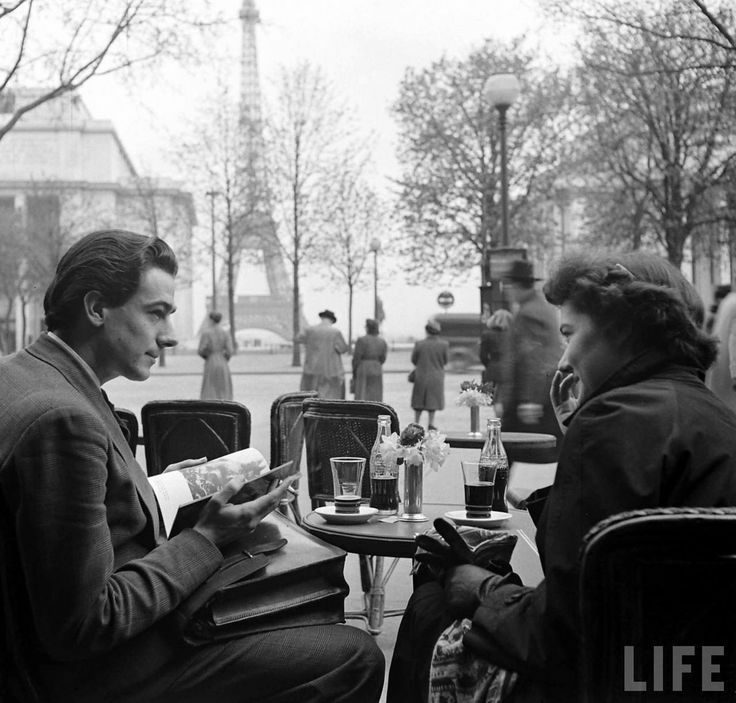 The character of the song leaves the house, kisses his wife and children and goes to work. There he works “as if he were a machine”. Finally, he falls from the scaffolding in the middle of the street “like a package, disrupting the traffic”. The lyrics are truly brilliant, written in dodecasyllable verses with each sentence ending with a proparoxytone word (that is, stressed on the antepenultimate syllable). The stanzas are repeated three times, with some keywords being changed position; these changes make the understanding of the lyrics ambiguous as it is not clear whether the worker dies as a result of the bad working conditions or he commits suicide, desperate in the face of his scant life prospect. “Construction” would not be so overwhelming without the symphonic, imposing arrangement conceived by Rogério Duprat, who uses the orchestra as a sinister component, emulating the chaotic noises of the metropolis, its horns and buildings under construction. The song is a strong critic of workers’ alienation in a modern, urban capitalist society; it is still a reference song to understand a thorny period of Brazil’s history. Deservedly, “Construção” was selected by Rolling Stone magazine as the greatest Brazilian song of all times. The Baianos Antônio Carlos and Jocáfi composed and first sung this beautiful song (“You abused”), which was successful with the sultry voice of Maria Creuza -who later married Antônio Carlos. It became an international hit, particularly in France, where it was later adapted by Michel Fugain with the name “Fais comme l’oiseau”; other famous versions are those by Celia Cruz and Stevie Wonder. “How foolish” is a bossa nova song composed by Antônio Carlos Jobim, with lyrics by Vinícius de Moraes. The song resembles Chopin’s prelude in E minor. It has been re-recorded many times by Brazilian and foreign artists such as Olivia Newton-John, Liberace, Iggy Pop, and Pat Metheny. Nevertheless, I love this version, performed by “the muse of bossa nova”, Nara Leão. Latin pop superstar Roberto Carlos is a major figure in Brazil – and worldwide: his popularity as romantic ballad singer is perhaps rivalled only by Julio Iglesias. During the 60s he initiated a major revolution; in a period when the Beatles were taking over the world, Carlos became their Brazilian counterpart as the leader of the Jovem Guarda. Initially a TV show, this “Young Guard” soon became not only a musical style, but also a behavioral, fashion and language influence to an entire generation. With his light music and simple lyrics, he was a deep contrast to “serious”, “somber” MPB. Managing to pursue a successful career throughout the years, Roberto Carlos is arguably the most successful romantic artist in Brazil, gaining the title of “The King”. Together with his longtime partner Erasmo Carlos, he composed this timeless ballad whose lyrics are, according to Rolling Stone Brazil: “…among the most beautiful in the history of music, in any of the five continents”. Arguably one of Brazil’s most amazing voices, a representative figure of the Tropicália movement, an indisputable timeless icon. Gal Costa is a star that keeps shining for over 5 decades. Back in the 70s, things were not easy for Gal. While all her friends had gone away, exiled by the dictatorship, she decided to stay in Brazil, as part of the “resistance”. And she managed to become the muse of Tropicália with the show Gal a Todo Vapor. Directed by Wally Solomon, the show was recorded in her outstanding double album Fa-Tal. “Vapor Barato”, included in Fa-Tal is about the disenchantment of the post-1968 years, of course expressed in a very poetical, metaphorical way so as to remain under the radar of censorship. Although now considered a timeless song, it had been almost forgotten until filmmaker Walter Salles “rescued” it by including it in the soundtrack of the film Terra Estrangeira (Foreign land). Brazilians’ passion for football (soccer) is not a secret; therefore, a song devoted to a football player comes to no surprise. “Filho Maravilha” is a song written by one of the most important Brazilian artists, singer and songwriter Jorge Ben (later renamed Jorge Ben Jor), and refers to Brazilian football player João Batista de Sales, better known as “Fio Maravilha”. 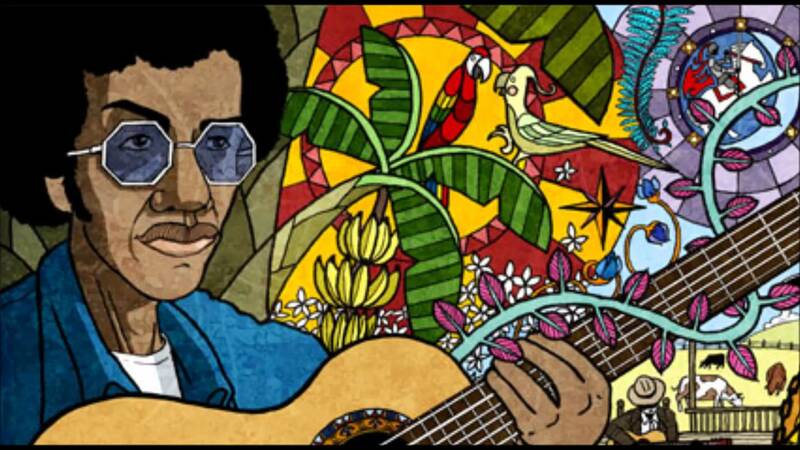 Always innovative and open-minded, Jorge Ben has been a member of most of the important movements of 20th Brazilian popular music. He is the author of two of the most legendary samba songs: “Mas Que Nada” and “País Tropical“. Sérgio Sampaio was not a mainstream artist. His elaborate lyrics, often with literary references (he was an admirer of Franz Kafka) did not enjoy much commercial success. Nevertheless, his enormous talent and his irreverent manners were invariably praised by critics and a selected public. He did have one big hit, “Eu Quero é Botar Meu Bloco na Rua” (I want to throw my troops on the streets), a song that refers, as many songs of that period, to the military dictatorship and Sampaio’s wish that everybody goes out and express anything they had keep to themselves. Milton Nascimento is one of Brazil’s most talented and influential artists, with a sublime tenor voice “that often slips into an ethereal falsetto, (…) as that of an angel”, the New York Times once wrote. San Vicente is one of his greatest classics; it has become an anthem, both in Brazil and other Latin America countries. Recorded in 1972 in the double collective album Clube da Esquina, it is, without any doubt, one of the most beautiful songs of the Brazilian popular songbook. Milton has interpreted it with many other artists, of which those with the remarkable Brazilian percussionist Naná Vasconcelos and the Argentinian iconic singer Mercedes Sosa are just marvellous. The most iconic percussionist of the 70s –and still one of the world’s greatest, Airto Moreira (or just Airto) helped make percussion an essential part of modern jazz; he has collaborated with the greatest names of jazz such as Miles Davis, John McLaughlin, Al Di Meola and Chick Corea. This song was part of his masterful 1973 album “Fingers”, and was composed together with Uruguayan artist Hugo Fattoruso. What Airto probably never imagined was that “Tombo In 7/4” would become a huge mainstream success, until German group Bellini sampled it in 1997 to create the super hit “Samba de Janeiro”. Os Novos Baianos is regarded as one of the most important and revolutionary groups in Brazilian music. They had a primordial role in the fusion of rock with Brazilian folklore rhythms, helping along the evolution of MPB. Formed in Salvador, Bahia in the late ’60s by Paulinho Boca de Cantor , Pepeu Gomes , Moraes Moreira, Baby Consuelo and Luiz Galvão. This song belongs to their third record, Novos Baianos F. C.; it displays the enormous talent of the band, particularly through the voice and violão (acoustic guitar) of Moraes Moreira, and the electric guitar of virtuoso Pepeu Gomes. Raul Seixas is without any doubt one of Brazil’s fundamental rock musicians. In spite of his premature death at 44 years old in 1989, “Raulzito” –his nickname- remains a strong influence to popular music and a timeless idol for Brazilian people. His expressive and existentialist discography was heavily marked by his collaboration with the outstanding novelist Paulo Coelho. From his numerous hits I find this song (“Walking metamorphosis”) is one of the most beautiful; it was released in his acclaimed debut album Krig-ha, Bandolo! Raimundo Fagner (or just Fagner) is a singer, composer, musician, actor and music producer. He has managed to remain highly successful from the beginning of his career in the 70s till nowadays, not only in Brazil, but also abroad -particularly in Spanish-speaking countries. During his long career he has recorded in several countries and collaborated with many international artists, leading to the release of -so far- 35 albums (the last one in 2014). This song belongs to his debut album, Manera Fru Fru, Manera. Nelson Cavaquinho is -together with Cartola- the most talented and prolific samba composer: he left 600 compositions that have been recorded by some of the greatest interpreters of Brazilian music. Cavaquinho composed the tune for this beautiful samba and Guilherme de Brito wrote the lyrics, which are among the most heartbreaking of Brazilian music: “Get your smile out of the way, ‘cause I want to go by with my pain”. Its tone is typical of the pair, usually pessimistic about love and life. Formed in 1971 by Ney Matogrosso, Gerson Conrad and João Ricardo, Secos & Molhados is one of few bands who led Brazil from bossa nova through Tropicália and then to Brazilian rock. Much of the group’s success, apart from their masterful first eponymous album (one of the biggest selling phenomena of the 1970s), was their extravagant stage presence, with heavy use of makeup and dramatic elements, and of course Ney’s signature counter-tenor voice. “Rosa de Hiroshima” was originally a poem by Vinicius de Moraes. Its very powerful lyrics are a criticism to war; the poetic tone managed to fool censorship and became a huge success during the seventies. 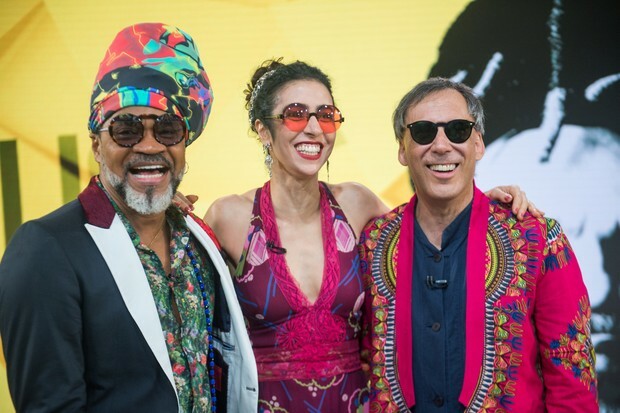 Appreciated for their particular blend of traditional samba and humor, Os Originais do Samba became a commercial success, achieving three gold records during their long-lasting career. Their fame in Brazil extended abroad: they were the first samba group to perform and record at the Olympia in Paris; they also performed in the USA. This song (“Nostalgic Shed”) belongs to the great paulista composer Adoniran Barbosa; it has been performed by many artists including Adoniran himself, but this version by Os Originais do Samba is my favourite. With his fancy dressing and emotional interpretations, Benito di Paula became the father of a new samba style, which would be known as sambão-jóia, a romantic and commercial genre precursor of contemporary pagode romântico. This was one of di Paula’s greatest hits; it was covered by artists like Two Man Sound and Sylvia Vrethammar. “A a stick, a stone, it’s the end of the road”… “Águas de Março” describes the beginning of the rainy season in Brazil, the month of March, which also marks the end of the summer (in the Southern Hemisphere). The element of water is a metaphor for a rebirth, a promise of life. Both the lyrics and music have a constant downward progression much like the water torrent from the rain. Tom Jobim wrote both the English and Portuguese lyrics. Although there were previous recordings, this is the version that many consider definitive; it was recorded by Elis Regina and Tom in the album Elis & Tom. “Águas de Março” was named as the all-time best Brazilian song in a poll conducted by the newspaper Folha de S.Paulo, and the second greatest Brazilian song by the Brazilian edition of Rolling Stone . Musician and songwriter known for his humorous and ironic musical style, Tim Maia is regarded as one of the biggest icons of Brazilian music. Mostly acknowledged for introducing soul into Brazil’s musical scene; he also contributed to a wide variety of musical genres, such as funk, bossa nova, disco, romantic ballads, pop, rock, jazz, baião and MPB. This song belongs to his fifth album, Tim Maia Racional Vol. 1. Although not well received by the critics at that time, it is now regarded as one of the best albums of all times, ranking 17 in Rolling Stone’s list. “Queen of Samba” Clara Nunes is considered one of the greatest of her generation. She was the first female singer in Brazil to sell over 100,000 copies of a record, and at the peak of her career she would sell more than a million copies of each album she released. Nunes was researcher of the rhythms and folklore of Brazil and the roots of black music, she even converted to Umbanda in her later life. She died in 1983 at the age of 40 years old; nevertheless, she remains one of the most popular singers in Brazil. This song (the title means “Last Judgment”) was written by Nelson Cavaquinho, and belongs to her album Claridade. Cartola is one of the most wronged cases of Brazilian music: he became known only at advanced age, although his songs had been often recorded by other singers. Nevertheless, he is considered one of Brazil’s quintessential artists. This particular song, sophisticated and delicate as most of his songs, was released in his masterful second disc Cartola II. It was included in the soundtrack of the highly acclaimed film Cidade de Deus (City of God), and lately in the TV series 3%. O Que Será (What may it be?) was composed by Chico Buarque for the film “Dona Flor e Seus Dois Maridos”, based on the book by Jorge Amado.There are three versions of this song: “O que será? (Abertura)“, performed by Simone; “O que será? (À flor da terra)“, sung by Chico Buarque; and the mesmerizing “O que será? (À flor da pele)“, in which Buarque is accompanied by the incomparable Milton Nascimento. The song has a deeply passionate tone, although there are many interpretations of its lyrics. Elis Regina is certainly one of the most talented singers to emerge from Brazil, often deemed the greatest Brazilian singer of all times. With her explosive personality and her sublime voice, she gained the respect not only of the Brazilian people, but also of the nation’s leading songwriters, who would line up to have one of their songs recorded by her. Elis’ death at the age of 36 shocked the whole country; nevertheless, she remains as popular after death as she was in life. This beautiful song is interpreted together with Milton Nascimento, and belongs to her album Elis. Maria Bethânia is one of Brazil’s biggest voices, with a long and successful career: she is among the 10 best-selling music artists in Brazil, having sold more than 26 million records. Talent seems to run in her family’s veins: Bethânia is the sister of the singer-songwriter Caetano Veloso and of writer-songwriter Mabel Velloso, as well as being aunt of the singers Belô Velloso and Jota Velloso. From her album Alibi comes Sonho meu (“My dream”), where her unique voice blends with another, incredible one: Gal Costa’s. It is curious that in a city with great musical representatives like Os Mutantes and Demônios da Garoa, no one could decipher São Paulo better than the baiano Caetano Veloso. “Sampa” (short for São Paulo) is Caetano’s tribute to the city of São Paulo, known for its characteristic drizzle and the large number of migrants, especially from the Northeast region of the country (pejoratively called “baianos”). Pollution, the reception to migrants, the multiple cultures and the dreams of their inhabitants are pictured in the elegant lyrics, so intense to make the song an all-time classic and transform the intersection of Ipiranga and São João Avenues in one of the most famous spots of the city. In the song, from the album Muito (1978), Caetano is accompanied by the group Outra Banda da Terra. A civil engineer-turned-singer/songwriter, João Bosco would become one of Brazil’s most formidable songwriters, with songs recorded by the country’s greatest artists. During his early career, he supplied Elis Regina with some of her best material; since Elis’ death he started to perform his own songs, becoming an emblematic figure in Brazil’s musical scene. This is his most personal protest song (English “The Drunkard and the Tightrope Walker”), which was selected as the theme song of Amnesty International. I love this version, sung by Bosco himself, although “O Bêbado” was made famous mostly by Elis Regina. Written during the last years of a military dictatorship, it is a deeply metaphoric, poetic song, not easy to understand on a first read. The drunk represents the artists, poets and musicians who dared to raise their voices against the dictatorship, the Equilibrist is the hope for democracy, which at every “event” that disturbed the military (marches, etc), saw its existence threatened. Already a star from the 60’s, Gilberto Gil is known not only for his innovative musical style, but also for political and environmental activism. This song (“Every girl from Bahia”) is a tribute to women from Bahia, and was reportedly inspired by Gil’s teenager daughter; it appeared in his album Realce. Beth Carvalho’s name is synonymous with samba, particularly the Mangueira Scola do Samba. Singer, guitarist, cavaquinist and composer, she began recording in the mid ‘60s; her interpretation of “Andança” earned her the third place at the III Festival Internacional da Canção and became a classic of MPB, re-recorded by many great singers like Maria Bethânia, Elis Regina, and Nana Caymmi. Her 1979 album No Pagode is considered a masterpiece, and featured this song, her biggest hit of all time. In the late ‘90s, the song was even sent to outer space in the space probe Pathfinder! In my previous post I presented an overview of Brazil’s music history and styles. This article will focus on the music of the first half of the twentieth century. During this period, Brazil’s Teatro de Revista became a very popular genre, inspired by European operetta. It reached its peak in the 30s and revealed talents like Carmen Miranda, Wilza Carla, Dercy Gonçalves and Elvira Pagan, who had immense success. Also in the late 1930s, the so-called Radio Era began in Brazil. As the process of recording discs was still primitive with poor quality results, the radio became the preferred circulation channel for new productions. This communication medium played an important role on the diffusion of popular music until well into the 1950s, but it quickly lost space when television became popular. Some performers that conquered the national audience were Dolores Duran, Dalva de Oliveira, Cauby Peixoto, Nora Ney, Emilinha Borba, Marlene, Vicente Celestino and Ângela Maria. During this period the popularity of samba intensifies, and by the end of the 50’s bossa nova starts making its appearance. Known in the English-speaking world simply as “Brazil“, it’s one of the most famous Brazilian songs, written by Ary Barroso. With this song, he created the genre known as samba exaltation for speaking of Brazil’s great qualities. “Aquarela do Brasil” became successful after being included in Walt Disney’s animated film Saludos Amigos. Since then, it has been recorded numerous times throughout the years, and was featured prominently in Terry Gilliam’s 1985 film Brazil. After “Garota de Ipanema”, it is the most recorded Brazilian song in the four corners of the planet. This wonderful original version was performed by Francisco Alves; other great covers are those by Elis Regina and João Gilberto. No other composer of Brazilian music portrayed the sea as well as Dorival Caymmi. Among all his songs this one is certainly one of the greatest classics and has been recorded in other languages by interpreters from all over the world. The vastness of the sea of his native Bahia was Caymmi’s greatest inspiration for this song. Although first presented in 1917, it reached the peak of popularity in the 40s. One of its most successful versions is the one by Ademilde Fonseca in 1942. 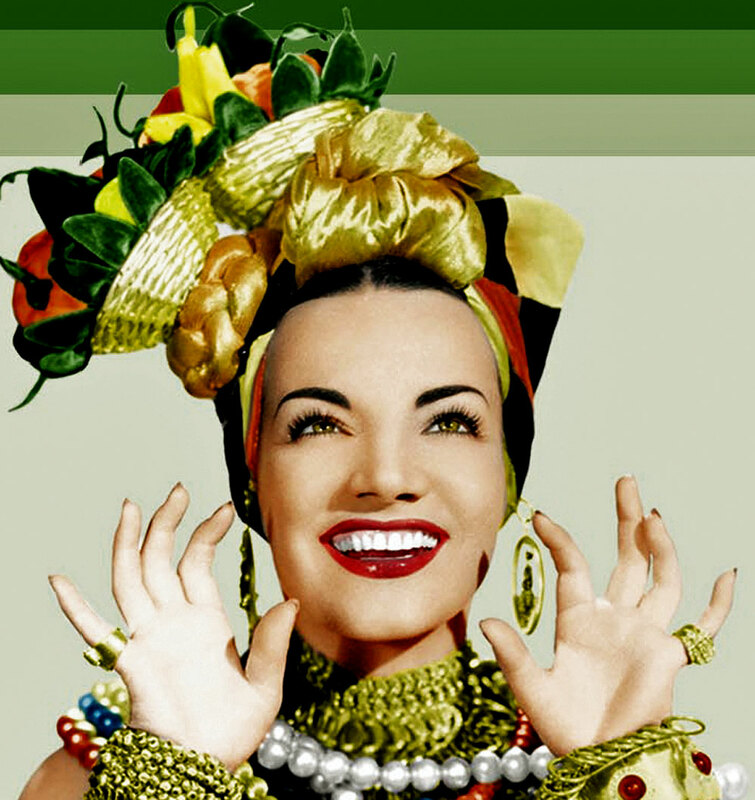 This is one of the songs that contributed to the internationalization of Brazilian music, mostly since it featured in several American films, such as Copacabana (1947), in which it was eternalized by the iconic fruit-basket head-dressed Carmen Miranda. Written by Luiz Gonzaga and Humberto Teixeira, asa branca (“white wing”) refers to a bird of the parched sertão (the semi-arid region in Northeastern Brazil ). The picazuro pigeon symbolizes peace, longing and exile. But the evocative lyrics of the song speak of the difficult conditions of sertanejo’s life. The bird flaps wings to find a better life and the protagonist of the song does the same. But he promises to his love that someday he will return, when the rain falls again. There are more than 300 versions of this song, but no interpretation beats the one by Gonzaga. Waldir Azevedo is one of the most famous cavaquinho players of Brazil. This song, representative of the choro genre, would become a reference for all the instrumentalists of Brazil and was a huge success from the moment it was released. Launched in 1935, this samba perpetuates one of the lightest and most relaxed lyrics of that time. It was written, however, in a tense time – marked by the 1930 Revolution in Brazil and by the crack of the New York Stock Exchange. The most acclaimed versions are by Aracy de Almeida, Chico Buarque and by Noel himself, one of its authors. This song is often considered to be the first recorded bossa nova song. The music was composed by Antonio Carlos Jobim and the lyrics were written by Vinícius de Moraes. João Gilberto‘s version is the most famous, although the original one was recorded one year later. The title can be translated roughly as “enough longing,” though the Portuguese word saudade carries a far more complex meaning. The word implies an intensity of heartfelt connection that is yearned for passionately. Chega means no more, enough. There are countless recordings of this classic bossa nova song, but this one arguably surpasses all the others. Composed by Antônio Carlos Jobim, it was released in João Gilberto‘s seminal album Chega de Saudade. Its strange melody, its deliberate debauchery and the incomparable guitar sound had never been heard before. Although Brazil had already exported some songs before this one, nothing compared to the impact that “Desafinado” had when it was recorded in 1962 by Stan Getz and Charlie Byrd for the album Jazz Samba. It was the music that definitively put bossa nova in the international scene and took Brazilian music to an era of modernity. “Desafinado” means “out of tune” and was a response to critics who claimed that bossa nova was a new genre for singers who can’t sing. This samba-canção is the most famous song of carioca Dolores Duran and the one that best defines her particular style. A successful singer in a country that, at that time, had no tradition of women composers, Dolores gained more popularity after her death at age 29, one month after releasing this song. The most notorious composition of carioca violinist Luis Bonfá was used in the soundtrack of the film Orfeu do Carnaval (Black Orpheus) directed by Marcel Camus. The film won the Oscar for Best Foreign Language Film in 1960, after which this beautiful song conquered the entire world.